The worst 'good luck' card ever? A Mexican illegal immigrant was stopped as he entered Britain when a search of his luggage uncovered a good luck card for his "new life in the UK". 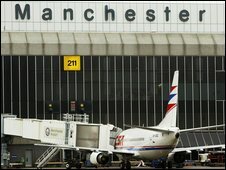 The man, arriving at Manchester Airport from Los Angeles, claimed he was on a brief visit to a friend who was opening a restaurant in England's North West. But he admitted planning to work illegally after border officers found the card and pages of Mexican recipes. The 40-year-old chef was removed on Friday, a day after landing in the UK.